Today, I had another chance to have a peep at the Magnificient Blue-Yellow "Monster" named Baaz! This loco (#20012) is one of the early locos manufactured by Diesel Loco Works (Varanasi). The loco has fibre cabs and has a different look as compared to a normal WDP/G 4 loco. This loco has its edges curved in a funky style as compared to the "hard" edges of the normal EMD locos! I love this loco! Other than spotting the Baaz, I had much more interesting spottings this day - I left Belapur as usual at about 06:30 (by the 06:33 EMU). The Day was normal until I reached Kurla. As my EMU was pulling into Kurla, I saw the Sharavati Express rushing past with WDG3A #13048 from Pune in charge. I boarded the 07:17 Ambernath Fast. On my way, I saw the Chennai-Mumbai Mail rushing past with a WCAM3 (Yes! It was a WCAM3!!! 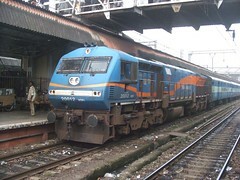 ), and the Kanyakumari-Mumbai Express with a WCG2. (Kanyakumari also had a Milk Tanker right behind the loco!). While my EMU was pulling into Thane, I saw the Mumbai bound Devgiri pulling out. The loco was a WDM2 from Pune!!! Just as I alighted at Thane, the PA system announced the arrival of Mandovi express, and I decided to wait for her! I was taken to a surprise by this loco! In the noon, while returning - I was fed up with the monotonous route that I have been taking for the past 4 months! I decided to take the Panvel route (via Diva) for the day. I had the Matsyagandha express at that time. I purchased a Superfast ticket and rushed to the platform. The train pulled in sharp at 14:30 with WDM3A #14126 from Erode doing the honours. I boarded the SLR right behind the loco. The coach was 94736 based at Mangalore. The loco was a good performer with good heart throbs! I enjoyed every bit of the journey. I kept an eye for the Assistant Loco Pilot (ALP) as the train picked speed. The loco moved out of Platform 7 Loop line, crossed over the Through "UP" line and entered the Through "DN" line. The ALP kept watching through his window as the loco slowly notched to maintain speeds in the range of 30 kmph. The ALP noticed that the last coach had cleared the loop and he waved his flag vigorously. The loco notched vigorously soon after! He picked speed quickly, but had to slow down for crossing the Parsik Tunnel. Right after the tunnel, the train got a red. There was a Tanker rake (hauled by a WCAG1) right ahead of Matsyagandha. The train kep waiting for some time. An OHE inspection van crossed us. Some time later, the train crawled towards Diva Outer. Here the train waited for about 5-8 minutes for the Tanker rake to clear the main line, and an EMU to cross us. The train then picked speed and crossed over to the Diva-Roha branch line. The train usually crawls through the platform to let railway staffers to "jump" into the train. The loco usually picks speed as soon as she crosses the Starter. The train kept going at a good speed until Nilaje. At Nilaje, the train was diverted to the loop line. A long Container rake, hauled by a WAG7 (#27695) from New Katni Junction was occupying the main line. The loop line seemed not to be in regular use! The train crawled through the platform and then joined the main line. On reaching the main line - it was business as usual! The train had a very un-eventful run until Panvel. She pulled into Panvel sharp at 1535. At Panvel, a railway staffer handed over a huge bunch of caution orders to the ALP! The train stopped much before the end of the platform. Matsyagandha re-fuels its loco at Chiplun unlike Netravati/Mangala which re-fuel at both places (Panvel and Chiplun)! I got down from the train, snapped an image of the loco and walked towards the suburban section. Just then, I saw a Kalyan "baldie" WDG3A entering Panvel. I stayed over the FOB to see as to which line the train would enter. Surprisingly, the train entered the Platform line! The loco was WDG3A #14599. Though the loco was leading, she had an LV board hanging on her face! Probably that happened because of an oversight! I boarded the 15:57 EMU back home! I reached Home at about 16:30. Thanks for reading this long update! Hope to see you again tomorrow!